"Green Gorilla" is an amazing book because it is simple yet comprehensive at the same time. Being the author of several raw food books myself, I found that I couldn't put this book down. 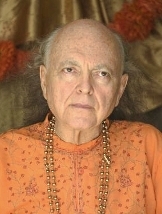 Avatar Adi Da Samraj powerfully conveys the numerous benefits of the raw food diet. I am especially impressed with the way he ties overeating with ego-bound addiction to pleasure. I recommend that everyone read this book. My "right life" Teachings apply to everyone. People do not necessarily have to become My devotees at the moment to benefit from these Teachings. The gross body is, very simply, the food-body. The gross body (itself) depends on (and is made of) food. The quality and quantity of food largely (or very basically) determines the state and desire and action of the physical body and the sense-mind. If food-taking is intelligently minimized, and if the food selected is both pure and purifying, then the physical body (and, therefore, also the brain), and, thus and thereby, the entirety of the body-brain-based patterning of emotion and mind, passes through a spontaneous natural cycle that shows (progressive) signs of (first) purification, (then) rebalancing, and (finally) rejuvenation. Aprincipal element of the raw fructo-vegetarian dietary practice I have Given is the regular (daily) use of "blended green drinks". Made (most commonly) of green leafy vegetables and sweet fruits. "Green drinks" provide a highly concentrated form of the nutrients found in green leafy vegetables--generally in much greater quantity than could be ingested by eating the greens whole. The sweet fruits are added to "green drinks" in order to make the concentrated greens palatable, and also to provide additional nutrients and calories. Blended "green drinks" are prepared using one or more varieties of green leafy vegetables--using whatever edible greens are available In temperate climates, appropriate edible greens include such plants as kale, chard, spinach, lettuce, collard greens, bok choy, and so on. Edible weeds (including, in temperate zones, such plants as dandelion, lambsquarters, plantain, and so on), herbs (such as dill, basil, cilantro, mint, parsley, and so on), sprouts (such as alfalfa, clover, sunflower, and so on), other vegetables (such as celery, cucumber, and so on), and medicinal plants (such as aloe vera) may also be added to a "green drink". Part One: Principles of the Searchless Raw Diet. Part Two: Discourses on the Searchless Raw Diet. Part Three: Living the Searchless Raw Diet. Green Gorilla is a wonderfully clear presentation of simple, practical instruction on how to follow a balanced and effective raw diet. Beyond that, what makes the book truly unique is Avatar Adi Da's invaluable wisdom about the importance and significance of the raw diet - in the context of the life of spiritual practice, and for humankind as a whole.